Free woodworking plans for kids funiture. These free woodworking plans will help you build or design your next kids furniture project. Try one out, your kids will love you for it. 6 Free Woodworking Plans found in the "Kids Furniture" Category. 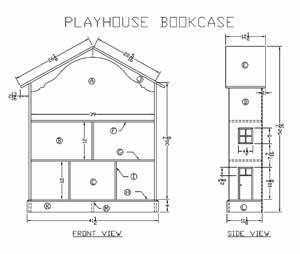 This plan has full color diagrams with a materials list, and very good descriptions. This combination would make a great project for the kids room or play room. A simple, yet useful easel with simple instructions, a materials list, and a complete diagram. Build this project for your kids or grandchildren. Better yet - get them involved with the project. An interesting and unique baby cradle design. This early american baby cradle can also be made into a doll cradle with simple modifications. Baby changing tables are a wonderful - yet expensive - addition to any nursery. With that in mind we set about building a baby changing table that would provide a strong combination of practicality and price. The resulting table has subsequently been "battle-tested" for the past month and has stood up to the demands of both mother and baby. Even better, when your baby (finally) outgrows the need for diapers, the changing table can be used as a children's chest of drawers. Note that the baby changing table does not have a rail around the top. Instead, it is designed to accommodate one of the standard curved foam changing pads.